Need a Break from the Grill? 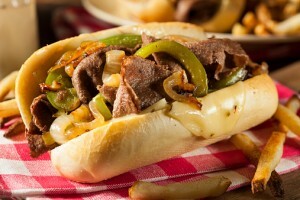 Try this Crockpot Philly Cheese Steak Recipe. By the time August rolls around, many of us have had our fill of the grill. Maybe it’s because fall is right around the corner, or maybe it’s simply because we’d like something that hasn’t been flame-broiled, but in late summer our thoughts turn to heartier fare. Unfortunately, outdoor temperatures in August often don’t lend themselves to firing up the oven, so what can you do when you want something a little different? Take advantage of your humble Crockpot, of course! The delicious Crockpot Philly Cheese Steak recipe we’re sharing with you comes from life and wellness coach Sally Twellman. Made with a few simple ingredients you can find right at Charlie Johns in Speculator, N.Y., these tasty steak sandwiches are a breeze to make in your Crockpot and are great as a take-along to a tailgate party or for a quick meal when you’re on the go. Enjoy! Slice the beef, onion and peppers and place in the Crockpot. Add salt, pepper, minced garlic and beef broth. Place the cheese on each half of each roll and fill with the steak mixture. From fresh produce and the best meats, to a full-service deli and bakery, Charlie Johns has all the ingredients you need to make this recipe and more. Come visit us today at our Speculator, N.Y. location. You can see this week’s sales flyer on this website by clicking here.